My raspberry haul! I could have picked more, but the mosquitoes were too much for me. Well, after I was lamenting earlier this week that nothing in my garden was doing well, the weather got slightly cooler, and things took a turn for the better. I found a patch of wild raspberries on our property just west of where they were last year. (Apparently, I wasn’t looking in the right spot before!) 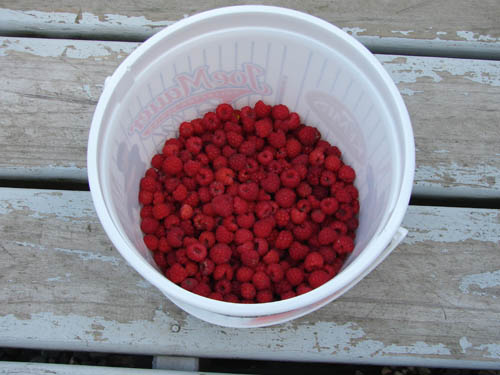 I picked about 6 cup of raspberries – some of which I ate, and some of which I froze for future use. While there weren’t as many raspberries as there have been in years past, I noticed that they were bigger. They were certainly worth the mosquito bites I got picking them. My garden has also produced a bowl full of red and delicious cherry tomatoes. And yesterday while I was picking some more beans, I noticed one tiny head of broccoli forming! I guess I have to remember that gardening is an exercise in patience. When you’re on the computer as much as I am, you start to expect things to happen immediately. The garden is a good reminder that some of the best things take time. Now does anybody have any good raspberry recipes they’d like to share? Wow, those look good! I usually don’t make anything with raspberries because I end up eating them all right away. I make my own raspberry vinagrette salad dressing. You can find all sorts of recipes online, but the one I use calls for red wine vinegar, olive oil, salt, pepper, garlic and raspberries. I just mix it differently each time to taste. That sounds lovely, Jennifer! I will have to try that!